Would You Buy an Electric Rolls-Royce? Score one for Rolls-Royce. In the battle waged by superluxury carmakers to win the hearts and bucks of the world's wealthy elite, one of Rolls' few rivals has conceded defeat. German luxury automaker Daimler  parent company of Mercedes-Benz  is pulling the plug on its $450,000 Maybach marque, whose main claim to fame is that it's longer and more powerful than its famous competitor. But, in the end, its sales were dwarfed by the slightly smaller but much more popular Rolls. "It's really a mercy killing," says Jay Nagley, an analyst at London automotive consultants Redspy. "I'm surprised it took them so long." While Daimler had hopes of selling 1,000 Maybachs a year, it has sold only a total of 3,000 since the car's relaunch nine years ago, and in recent years, sales dwindled to around 200 a year. In the end, the Maybach's demise is a cautionary tale of corporate hubris, of how an otherwise savvy auto company mistakenly thought if it built a limousine bigger and gaudier than a Rolls, the superrich would swoon over it. But the superrich, it turns out, want value for money too  and that's where the Maybach failed to deliver. The original Maybach debuted in the early 20th century and was popular with heads of state and celebrities in the 1920s and '30s. Maybach owners of that era included German boxing champ Max Schmeling and Ethiopian Emperor Haile Selassie. It stopped production during the World War II. But Daimler resurrected it in 2002, after its two main German competitors had each snapped up Britain's two most iconic luxury brands: BMW took control of Rolls-Royce while Volkswagen grabbed Bentley. The Rolls-Royce and Bentley's Mulsanne are so-called exotics: massive, smooth-riding cars that are full of torque, retail for more than $250,000 and nearly demand to be chauffeur-driven. "Daimler wanted to rival Rolls-Royce in old-school opulence," says Garel Rhys, a Cardiff-based automotive economist, and the company expected the car to appeal to captains of industry. But it turns out the very top end of the auto market isn't elastic enough to accommodate a new arrival  especially one that lacks an iconic brand name. Rolls last year sold a record 2,711 cars, and Bentley typically makes around 700 to 800 Mulsannes a year. Between the two of them, they pretty much satisfy worldwide demand for exotic cars. Maybach, on the other hand, was a niche brand even at its zenith and in the 60 years hence had faded from the car-buying public's collective memory. "The name didn't mean anything," Rhys says. Then there's the big price tag. What do buyers get for $450,000? The Maybach's a big, heavily engineered car that features lots of lacquered wood, hand-stitched leather and enough room to hold a board meeting  but, then, so are the Roller and the Mulsanne,. 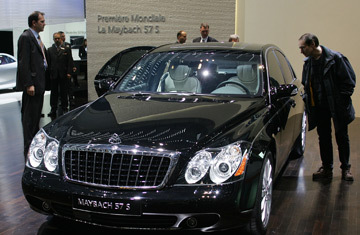 "All [Maybach] has going for it is sheer size," Nagley says. At 242.7 in. in length, the Maybach 62 is nearly 14 in. longer than the Rolls Phantom. As is often the case, however, size doesn't matter. "The Rolls-Royce is a far better-looking car and, objectively, a better car," Nagley adds. As for looks, he calls the Maybach's styling "appalling. It's bloated and bombastic  the ultimate expression of bling." Which may explain why the car did prove popular with a handful of Middle Eastern and Russian oligarchs, and also with some wealthy rap stars  many of whom place a high premium on all things bling. Diddy bought his son a Maybach last year as a 16th-birthday present, and Rick Ross named his record label Maybach. However, perhaps as an ominous indication of what lay ahead for the Maybach, Kanye West and Jay Z recently destroyed one in the video for their summer single "Otis." But that wouldn't have bothered Maybach much. The company was more interested in wooing corporate bigwigs like China's burgeoning population of millionaires and billionaires, with their predilection for oversize, costly status cars. But wealthy Chinese buyers also snubbed the Maybach because it lacked the cachet of the better-known Rolls-Royce. "Ultimately, it was a total disaster. Really, it's a failure right up there with the Edsel," says Rhys, referring to the turkey that Ford unsuccessfully tried to serve to 1950s car buyers. So, is the crash of the Maybach a sign that the 1% who could afford one are now in retreat, and that the premium car segment is tanking? No, not really. Sales of expensive cars remain robust. Indeed, Rolls says it's on track this year to beat its record sales of last year. Even Daimler says it is now focusing on its main brand, Mercedes-Benz, and plans to launch in 2013 three more exclusive versions of its flagship S-Class model  undoubtedly priced to give us, the 99%, sticker shock. See whether you would buy an electric Rolls-Royce.